Interventional radiology offers targeted, minimally-invasive therapeutic approaches that are viable alternatives to surgery. Some of the most common procedures include angioplasty, stenting, thrombolysis, embolization, radiofrequency ablation, and biopsy. Growing awareness of dose management has prompted equipment manufacturers to develop new dose-control solutions, helping physicians to strike the right balance between image quality and dose management. Medical device manufacturers have developed several new concepts for reducing dose, such as combining fluoroscopic and ultrasound imaging units. With efficiency and safety in mind, GE Healthcare introduced a combined fluoroscopy/ultrasound All-In-One Unit, the OEC Elite + Venue 40*, part of its family of Hybrid Operating Solutions (Figure 1). 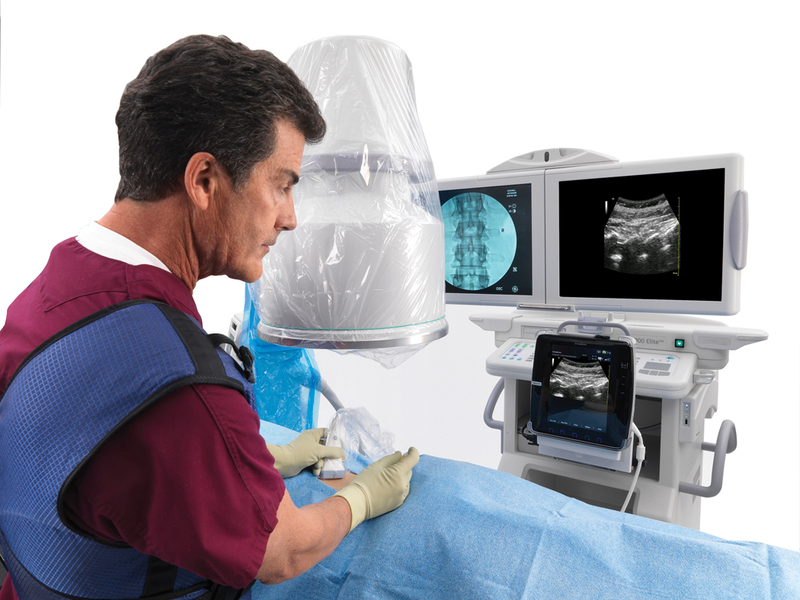 The GE Venue 40 tablet is mounted within the OEC 9900 Elite C-arm’s workstation, allowing interventionalists to access the ultrasound tablet to guide the insertion and placement of needles, guidewires, and catheters. The combined fluoroscopy/ultrasound unit minimizes the footprint in an already crowded operating suite and can eliminate the need to wheel in another imaging system. This helps to preserve a sterile environment and allows staff to view collocated displays for fluoroscopy and ultrasound without leaving the OR. “Substituting an ultrasound probe appropriately in some diagnostic or operative steps may obviate the need to generate an additional x-ray,” said Von Jako. Mounting data suggest ultrasound is promising in several interventional applications; as a result, applications for ultrasound-guided techniques are expanding. Dr. Von Jako also noted that in the peripheral vascular area, interventionalists rely on fluoroscopy to track and get a needle or catheter tip into a blood vessel. “Ultrasound assistance here in combination with a fluoroscopic-guided catheter procedure can be useful,” said Dr. Von Jako. Ultrasound is also useful for enabling hemodialysis access or access to various vessels for endovascular interventions. “By combining [ultrasound] with a C-arm, it may assist in facilitating interventional procedures mainly through the identification of soft tissues, blood vessels, and nerves, without exposing patients and personnel to the low levels of pulsed radiation, and by carefully displacing some fluoroscopic steps, the possibility to perform continuous imaging, and the visualization of the fluid injected in a real-time fashion,” said Dr. Von Jako. A recent study compared fluoroscopic C-arm guidance to ultrasound guidance in patients undergoing retrograde femoral artery cannulation.3 The study demonstrated that 30% of a patient subgroup had a higher bifurcation, in which a reduction in vascular complications were achieved using ultrasound and with markedly better first-pass cannulation rates using fewer tries in less time. “So ultrasound is promising, as it could be used to speed up cannulation attempts in some choice access sites, which include the femoral, radial, and brachial access areas; the axillary area under the armpit; and these areas that could benefit significantly from ultrasound when you are doing a procedure where you are going to guide a catheter with fluoroscopy. So it can be a good substitute for some steps that use fluoroscopy,” said Dr. Von Jako. The combined use of fluoroscopy and 3-dimensional (3D) cardiac ultrasound is gaining acceptance in a variety of cardiovascular and vascular procedures. Philips Healthcare just released EchoNavigator, (Figure 2) a live image-guidance tool to help interventionalists perform minimally invasive structural heart disease repairs by providing an integrated view of fluoroscopy and 3D ultrasound images. Another effective approach to lowering dose is to establish protocols using low pulse-rate fluoroscopy. Doctors at Johns Hopkins Hospital, Baltimore, MD, who led 2 clinical trials involving intra-arterial chemotherapy, took steps to reduce radiation dose exposure to staff and their pediatric patients—who are particularly susceptible to the effects of radiation. “Reducing radiation dose exposure is critical not only for patients but also for the staff who perform the procedures. There is an attainable balance between reducing radiation dose while maintaining patient safety and image quality. Clinicians can achieve this by going back to the basics of physics and fluoroscopy, and tailoring the examination to the individual patient. I routinely use fluoroscopic pulse rates of 3 pulses/sec for children and 3 or 4 pulses/sec for adults, without any compromise in patient safety or image quality,” said Monica S. Pearl, MD, DABR, an Assistant Professor and Interventional Neuroradiologist at Johns Hopkins Hospital. Dr. Pearl was the Principal Investigator on a recent trial treating retinoblastoma and another study on recurrent diffuse intrinsic pontine gliomas (DIPG). In both studies, chemotherapy was delivered locally either through the ophthalmic artery for retinoblastoma or the basilar artery for DIPG. Because these are rare tumors in children, doctors applied low-dose protocols. “Published radiation doses from diagnostic cerebral angiograms range from 350 to 4100 mGy.4-7 The delivered dose from a diagnostic cerebral angiogram can vary widely, but is for a large part dependent on operator technique and equipment. The physician performing the examination must make a conscious effort to employ techniques that aim to reduce radiation dose. These maneuvers are simple to apply and result in substantial dose savings to patients and staff,” said Dr. Pearl. The team conducted the trials using fluoroscopy and DSA on the Artis Zee system from Siemens Healthcare (Figure 3), but used ultrasound guidance for difficult femoral artery access. They created low-dose 3D DSA protocols, routinely used for the evaluation of intracranial aneurysms. In addition, the Artis Zee system provides Combined Applications to Reduce Exposure (CARE), settings that help users to control pulsed fluoroscopy, fully-automatic exposure, automated copper filter settings for reduced skin dose, radiation-free positioning of collimators, radiation-free positioning of the system, and dose monitoring and documentation. “In the last couple of years, with the Artis Zee and CARE features on the system, we have seen a significant drop in our radiation doses. 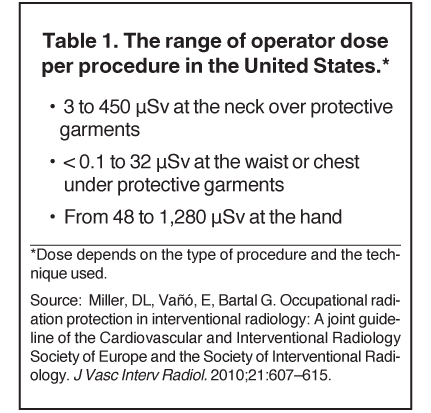 The radiation doses we see today on our exam protocols are half of what they were a few years ago. This can be attributed to improvements in technology, increased radiation awareness, and support from the engineers who are willing to work with us and modify our protocols,” said Dr. Pearl. While efficiency and combined technologies may reduce fluoroscopy or CT time, managing dose across the treatment cycle is critical. “Our dependence on fluoroscopy is increasing with the demand for less invasive procedures and emerging new techniques,” said Dr. Von Jako. One such technique is liver embolization (radioembolization), a standard palliative treatment for liver cancer, the fifth most-common cancer in men and the seventh most-common cancer in women.9 Throughout the course of treatment, however, multiple rounds of imaging are employed for treatment staging, planning, guidance, and follow up. Plus, the procedure itself uses radiation to kill the tumor. Therefore, if the benefits of liver embolization outweigh the risks of radiation exposure, doctors need to focus on how to best manage the dose. Neil Goldstein, MD, Vascular and Interventional Radiologist, Maricopa Medical Center, Phoenix, AZ, has found tumor therapy very effective, particularly when the disease is at an early stage, where there is a solitary lesion, or when the patient would otherwise not be a good candidate for surgery or chemotherapy. “You can have quite a lot of benefit with a very simple treatment, with a quick recovery time, and low risk using image guidance,” he said. Radioembolization begins with an angiogram to map the vasculature of the abdomen and plan therapy delivery. A CT scan is then administered to determine the size of the tumor or percentage of involvement of the liver to calculate the dose needed to treat the tumor. “During the treatment procedure, we need to get the catheter in place, and we use angiography to see how the blood is flowing as we deliver the microspheres. There is then also follow-up imaging with CT, MRI, or PET,” Dr. Goldstein explained. To minimize the use of fluoroscopy, Dr. Goldstein and his team use new digital road mapping technology to help guide the catheters and wires. GE Healthcare, for example, introduced FlightPlan for Liver, a treatment-planning process for liver embolization. The physician selects the tip of the catheter and a hypervascular tumor on a 3D image, and lets the software highlight the vessels traveling from the catheter to the lesion. The highlighted vessels can then be used as a roadmap with the Innova Vision application, by superimposing the map on the live fluoroscopic image for the to doctor guide the catheter into the target artery. Interventionalists can identify the tumor-feeding vessels and be more selective when planning liver embolization. Dr. Goldstein pointed out that because radioembolization delivers a highly concentrated volume of radiation to the tumor site, it is less harmful to healthy surrounding tissue than either external beam radiation or chemoembolization. Among interventionalists of all specialties, demand is growing for automated dose monitoring, optimization, display, and traceability of work. This year, GE Healthcare announced it is introducing DoseMap, available on GE’s Innova IGS 540 platform, an image-guided system with a 41-cm × 41-cm detector for vascular and interventional imaging. The DoseMap monitoring solution displays live cumulative patient dose levels and offers the operator the chance to change dose delivery, to help clinicians better monitor the dose and, in turn, to improve patient care by empowering clinicians to reduce/amend dose levels. GE also offers DoseWatch, a multimodality dose tracking and reporting solution. 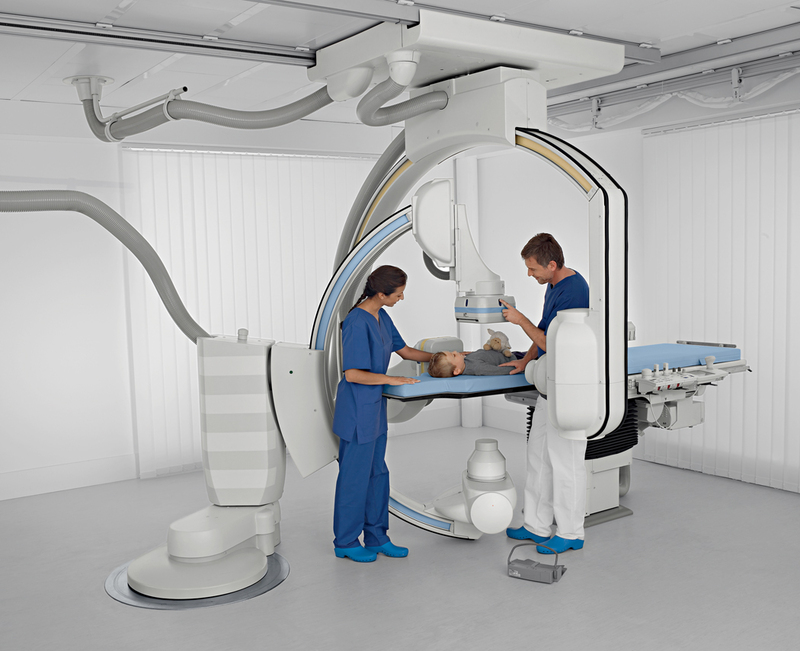 Also new is an x-ray tube technology in both the Artis Q and Artis Q.zen (both pending 510(k) clearance) by Siemens. These angiography systems are engineered to help physicians identify small vessels up to 70% more accurately than with a conventional x-ray tube technology. The Artis Q.zen combines this x-ray source with a new detector technology and can use doses as low as half the standard levels applied in angiography, which is particularly useful during longer interventions. The benefits of minimally invasive procedures may outweigh the risks of radiation exposure, but the entire clinical team should still take steps to minimize radiation exposure to levels that are as low as reasonably achievable (ALARA). “Whenever ionizing radiation is used in diagnostic imaging procedures, such as in CT, x-ray or angiography, we always strive for the ALARA standard with regard to the exposure to patients and the health care team,” noted Dr. Goldstein. Following basic safety guidelines is critical to dose safety. Adequate maintenance and usage of wraparound lead aprons at least ½-mm in diameter can cut down exposure to the user, along with a thyroid collar and special lead-lined glasses, which improve protection, especially over cumulative exposures. Knowing the basics, such as how far away to stand from the beam and placing the beam source under the table, helps to better protect the user over a career of use. Positioning the C-arm image intensifier closer to the patient minimizes external exposure, minimizes patient skin exposure while creating a better image, and protects the physician and staff. “Having the image intensifier further away from the patient allows for greater scatter radiation and as much as 80% of the scatter can come off the patient. But if you step 3 or more feet away, it cuts down the amount of dose exposure significantly by a factor of 4,” said Dr. Von Jako. “Another useful method is using pulse mode at 15 frames per second, instead of high-level fluoroscopy at 30 frames per second. The amount of dose that can be reduced using pulse mode versus a high level beam can be up to 30% or more. If you collimate the beam, narrowing it down to the field-of-view you want, this feature cuts down the dose to the patient, as does another feature called last image hold (LIH), allowing for a review of recent anatomical images without taking extra shots. These are advantages that already exist in C-arms. Adding an ultrasound option to this may help in certain procedures and circumstances to further the opportunity in reducing x-ray time,” he said. Dr. Goldstein’s team uses real-time dose monitoring that staff can see onscreen during procedures. Another tactic is minimizing fluoroscopy time. Miller, DL, Vañó, E, Bartal G. Occupational radiation protection in interventional radiology: A joint guideline of the Cardiovascular and Interventional Radiology Society of Europe and the Society of Interventional Radiology. J Vasc Interv Radiol. 2010;21:607–615. Radiation safety. Cardiovascular and Interventional Radiological Society of Europe (CIRSE). http://www.cirse.org/index.php?pid=153. Accessed February 28, 2013. Seto AH, Abu-Fadel MS, Sparling JM, et al. Real-time ultrasound guidance facilitates femoral artery access and reduces vascular complications: FAUST (Femoral Arterial Access With Ultrasound Trial). JACC Cardiovasc Interv. 2010 Jul;3:751-758. doi: 10.1016/j.jcin.2010.04.015. Mooney RB, McKinstry CS, Kamel HA. Absorbed dose and deterministic effects to patients from interventional neuroradiology. Br J Radiol. 2000;73:745-751. Struelens L, Vanhavere F, Bosmans H, et al. Skin dose measurements on patients for diagnostic and interventional neuroradiology: A multicentre study. Radiat Prot Dosimetry. 2005;114:143-146. Vano E, Gonzalez L, Fernandez JM, Guibelalde E. Patient dose values in interventional radiology. Br J Radiol. 1995;68:1215-1220. Theodorakou C, Horrocks JA. A study on radiation doses and irradiated areas in cerebral embolisation. Br J Radiol. 2003;76:546-552. Pearl M, Katz Z, Messina S, et al. Diagnostic quality and accuracy of low dose 3D DSA protocols in the evaluation of intracranial aneurysms [abstract]. In: 50th Annual Meeting of the American Society of Neuroradiology; New York, NY. April 23-26, 2012:p.249, abstract nr 0-511. Liver cancer incidence and mortality worldwide in 2008 summary. Globocan 2008. http://globocan.iarc.fr/factsheets/cancers/liver.asp. Accessed March 4, 2013. Interventional radiologists leverage low-dose techniques without compromise. Appl Radiol.